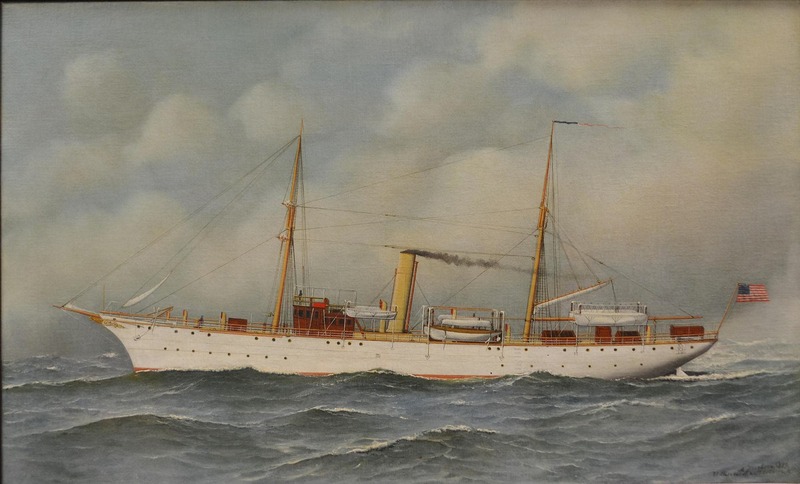 On February 9, 2018, the NOAA Central Library unveiled the newly restored painting, Pathfinder, painted in 1899 by renowned maritime artist, Antonio Jacobsen. Included as part of the NOAA Central Library Rare Books collection, the painting is the oldest extant painting of a NOAA ancestor ship in the possession of NOAA. The Pathfinder vessel was one of the U.S. Coast and Geodetic Survey’s early ships, in service from 1899-1941. The history of the Pathfinder is unique, as its career spanned 40 years charting Philippine waters before its loss in the early days of World War II. In addition to helping open the Philippine Islands to then modern ship-borne commerce, its pre-war work was instrumental for both strategic and tactical purposes in the retaking of the Philippine Islands during World War II.